Jan 30th 1970. This day I am thankful I am alive because I reckon I looked death in the eye, if that's the thing to say, today. It started with the sergeants group taking off to where they were yesterday or in that area. Our group took off about 200m south to another old location of c/s 51. Upon arriving there the boss said for me to take out a recce patrol and look for an ambush spot further down the track we were sitting on. All went well until we came across a track junction when my lead scout [Rex Ryan] said "let's look up this track" and as there was a funny smell like somebody making wine, I decided to have a look. I gave the scout the nod to proceed and away we went with the machine gunner [Dave McLeod] lagging behind as he thought it would be a waste of time. Little did he realise then just how wrong he was and I suppose he now wishes I had not taken this track. Suddenly the scout dropped to one knee and opened up into the bush in front, I called to the gunner and he ran forward with the machine gun firing at his hip. I yelled stop! as there were no incoming rounds. When they stopped it was really quiet so with the machine gun in a position to cover us I took the scout and we slowly moved forward for about 20m but the VC had gone. A hit was evident with t he amount of blood everywhere. I called the others up and told the scout and rifleman [David Wright] to scout around and see what the scout could pick up. I gave the boss (platoon commander) a call on the radio, as he was waiting in anticipation after hearing the signaller call "Contact Contact Wait out!". This is usual when an incident is started. I told him I was going to follow up. I got everyone back and slowly moved through the bush following the blood trail. After moving very nervously for about what I thought was about 300m (I was not worrying too much about distance at the time) the blood trail ran out. They tell us this is a sign that the enemy is on his last legs, so I sent riflemen out in front and to the side to look for more sign. They had hardly gone when in front from where I had sent the scout and the gunner there was a prolonged burst of automatic fire. I called to the others and took off, with them on my heels. I burst through some thick bamboo as if it was not there as nothing was going to stop me. When I reached a large clearing with waist high scrub there were bullets buzzing past like the proverbial bee, but with a deadlier sting. A rifleman yelled out "over here! over here!" and when I reached him there were two VC bodies on the ground with another group of VC taking off down a wide track. I yelled to the M79 operator to quickly fire some grenades down the track but he was in a daze so the lead scout grabbed the weapon and fired round after round at the departing VC but they had disappeared into the scrub. I had a quick look around to assess our position and decided to go into all round defence after putting a bullet into each of the two bodies on the track to ensure they were dead. I was directing one of my men [David Wright] into position, he was standing next to me, when a burst of fire came from God knows where and bullets whipped between the two of us striking our water bottles. The other soldier turned round to the rest of the section who at this stage (me included) were on the ground and started to say "the dirty chogie got my..." when another burst took him in the rear. This time I noticed a puff of smoke not 10 feet away so on one knee I fired a magazine into the bush and called out to the machine gunner to come forward and give it another burst. He no sooner got past me and started firing when the gun jammed and another burst came from the VC. I could even see the green tracer going into my gunner. I just about lost my cool at that stage and I threw a grenade at the bush where a single VC was hiding. After the dust settled I started to move forward to check it out when another burst of fire whizzed over my head and down I went again. Next moment one of the guys [Danny Campbell] came running up and as I put another burst into the bush, he grabbed the machine gun and in one motion cleared the weapon and stood up and walked into the bush firing at the same time with long deadly bursts of fire. When he stopped firing the silence was literally deafening and not a sound was heard. I slowly got up and then realised that it was not over yet. The scout by this time was with the rifleman who had been hit in the back and was putting on a shell dressing. The radio operator had come out of the bush and was administering 1st Aid to the machine gunner. I then got onto the boss and explained what happened and to get a "dustoff' in real quick. The sergeant butted in on the radio net and said he had identified our location and was coming in to assist, so I warned the others who had taken up all round defence as best as three guys could, not to open fire. I had a look at the rifleman’s wound and it did not look too good as it was at the back of the spine and all the shell dressings we had put on to stem the flow of blood were not very effective. 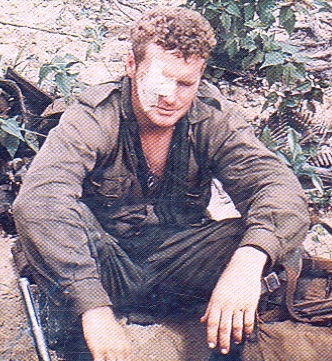 The machine gunner’s wounds did not seem to be bleeding too much although it looked like he had taken three bullets with maybe two rounds exiting. When the sergeant arrived he took over and while some of his guys were searching the bodies of the VC, he sent a party out to clear the area and check for more VC. The bodies had very little on them apart from a pack and general goods. The "dustoff' called up as they could not find us because I had given an incorrect grid reference (we had followed the trail for nearly 1000m not 500 as I had thought). Once on the radio they were soon over our LOCSTAT and the two wounded were quickly on their way to hospital. I then sat down and spoke on the radio to the Company commander explaining what had happened and where the rest of the VC had gone. Much later we formed up and I led us all back to the boss’s position. After going over it all again with him I tried to sleep but all I could see was the green tracer going into the machine gunners body and of course the face of the VC kid who did all the damage to us, he only looked to be about 10 years old. War is bad when they have to use kids to fight. If he had been older I might not have been here because he was small and when he pulled the trigger on the AK47 the weapon pulled upwards with most of the bullets going up in the air. When we arrived back at Company Headquarters a couple of days later the CSM (who was a tough taskmaster) was overheard to say that when our platoon left some days earlier we were just soldiers but on our return we moved and looked like fighting men.